The challenge that Tesla faces over the next few months is scaling production enough to achieve a certain gross margin on our product so we can be cash flow positive. That’s extremely important. If we’re unable to do that, we’ll enter the grave yard with all the other car company startups of the last 90 years. Tesla just started delivering its electric sedan, the Model S, in late June to its first customers and it’s got about 12,200 reservations for the Model S. But Tesla plans to produce and deliver 5,000 of these cars before the end of the year. The plan is to ship roughly 500 of the cars in the third quarter of this year, with the remaining thousands of cars to be delivered in the fourth quarter. That’s like the Monster Truck version of ramp ups: totally extreme. And Tesla has to do that dramatic ramp up without making any major production mistakes — major recalls on the cars could be a killer. The Roadster had a few part recalls, and Fisker suffered similar problems with production of its Karma car. It’s not uncommon for startup automakers (or even large automakers) to face such production glitches. Ramping up more slowly could mean delays for deliveries of the Model S, which in turn could deliver a drop off in the reservations. Tesla did see a significant amount of cancellations when it delayed delivery of its first car, the Roadster, by many months. Tesla also has to do this production ramp up and, like Musk said, also achieve a gross margin on the cars to reach profitability in 2013. Tesla’s business plan rests on breaking even on the Model S.
It’ll definitely be a very tough road over the next 6 months. We can’t afford to make a lot of mistakes. If we don’t make too many mistakes then we’ll get to that period and we’ll be able to bring out larger volume cars that are more affordable. Musk isn’t unfamiliar with tough times at Tesla. When Tesla was getting the Roadster out the door, there was a point where Musk had to personally fund the company and Tesla was dangerously close to being out of money. This time around, Musk has more access to funds (his own and investors) and experience, so if he made it through the first time, odds are he’ll be able to pull it off this time around. But still, the electric car pioneer has a rough time ahead for the rest of 2012. Tesla has been succeeding since 2006 against incredible odds. The Roadster was a success, the Model S so far has been, and judging from the flood of reservations for the Model X, it will be a success as well. So, to all you Tesla naysayers, go wallow in your anti-rhetoric. I’m going to be driving my future Tesla even though you said it will never work and no one will ever want one. For a first generation car, the Model S has sold quite well. I can’t wait to see the Bluestar and the next-gen Roadster! 8/2 Tesla Blog Post – we moved from building three cars per week, to five cars per week, to ten cars per week…. and we have 29 that are either already in the hands of their new owners or on their way via Tesla Personal Delivery. The largest challenge in ramping factories lies in ensuring your suppliers can ramp up with the same quality they delivered in low volumes. Musk already alluded to some supplier changes in Tesla’s Q2 earnings call. Since Tesla produces ~90% of all components internally (my estimate, from previous blog posts) this limits this exposure. The largest external supply is the Panasonic batteries…..they have a solid track record. Yes, Tesla needs to execute, but this ramp is not as challenging as it may seem…. This is Tesla’s “Superbowl”. But the difference is, if they don’t win, they may die. Planning alone won’t cut it. 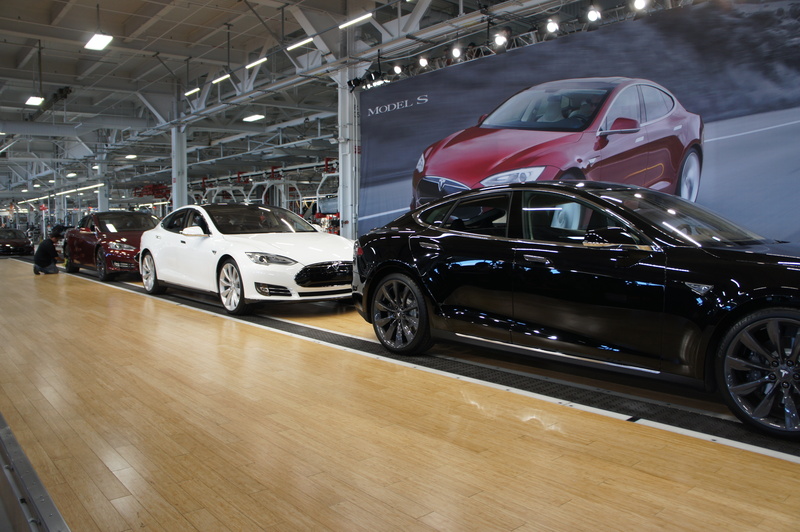 Tesla must execute, building and delivering one car at a time. In addition, they must promote / support the build-out of charging facilities across the vast U.S. and in other countries. I’m rooting for them but if indeed the company is “All In” on the Model S, there is no light at the end of the tunnel at this time. For instance, nobody knows what the range of the car is under normal driving conditions (highway speed, a/c on, radio, etc.). So why wouldn’t those first customers know what the range of the car is under normal driving conditions? It is a huge challenge but Tesla seems to have been planning for it effectively. Their target production rate of 80 cars per day is based on a one shift 40 hour week with the same employees currently. That rate is sufficient to meet their production targets if they ramp up to it by the beginning of October, even allowing for a week long Christmas break. They still have the option of working overtime and even adding another shift once they’ve gone up that steep learning curve to 80 cars per shift. It’s critical they focus on getting it right before very carefully speeding it up. It may seem counterintuitive but even though they are only producing a few cars per day now, and even though the goal is to produce more cars in the last 3 months of 2012 than the company has made in the last 8 years total…it is still completely realistic. A buggy v1 would be OK for an iphone app. But this has to be a *car*. We have to keep reminding ourselves of that. Tesla S has to have the reliability of at least a Ford Fusion or a VW Passat; otherwise it is a nonstarter. The incredibly low volume numbers do not inspire confidence in that front. The automotive industry has so many problems: Over-capacity, intense global competition, rigid labor, high and increasing cost of energy, congestion in more and more countries & cities… Tesla has an inherent advantage on only one of those parameters. No one should hold their breath.. Explain how any of those conditions is a problem for Tesla as they ramp up production, noting that Tesla plans to produce 5,000 cars and has reservations for 12,200 cars.